Import via iTunes is really a very special feature that is only required for very advanced users. For example, if you have 10’s or 100’s of songs in TXT format and want to get them into MySongbook quickly. Import via eMail is easier than this method. Please check that first as an option for importing. See Chordie.com to MySongbook for Internet Search import of Song with Chords. See Import Lyrics for just general import of Lyrics without chords. MySongbook can import songs in 2 formats. 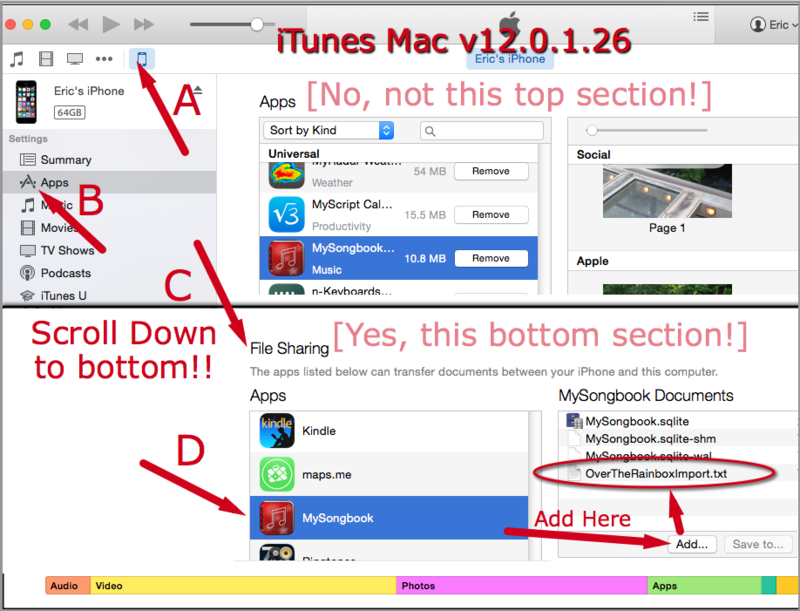 The import file must be transferred to the MySongbook app by using iTunes. Once the file is transferred to the iPad or iPhone, it will be imported when MySongbook is first opened. You will get a confirmation of the import and see it in your list. Step 1) Create import file: Songs can be imported in one of 2 formats with the following extensions. .mysongbook – This the format that MySongbook exports files. So if you exported from the MySongbook, you will be able to import the file as described below. .txt – A generic text format is provided to import songs that come from other sources. This is a specific format and you may need to modify your tab file to put it in this format prior to importing. The format is as follows. The blank lines are very important! There can be as many sections as you want. Each section must be a single line section title then multiple lines lyrics in simplified ChordPro format (or no Chords). See example at right. 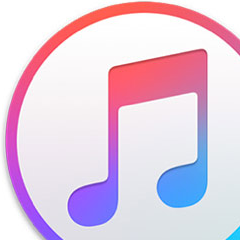 Step 3) Within iTunes, navigate to A) Your device (iPad, iPhone), B) Apps, C) File Sharing – Apps (note this is not the Apps at the top of the screen, you must scroll down to get to it. D) MySongbook in the File Sharing section. Step 4) Click Add and then find the file created in step 1. After it is added you will see it in the MySongbook Documents. Or, you can also just drag and drop the file from email or finder.